Set to compete in their second NASCAR Xfinity Series (NXS) race of the season, Tullman Walker Racing (TWR) head to Las Vegas (Nev.) Motor Speedway for Saturday afternoon’s DC Solar 300 looking for a solid finish. Sports Car standout and rookie ARCA Racing Series presented by Menards driver Max Tullman (@MaxTullman) will pilot the team’s No. 26 Ford Mustang in his intermediate Xfinity track debut. He has prior big-track experience in ARCA driving for Mason Mitchell Motorsports at tracks Chicagoland Speedway, Michigan International Speedway and Pocono (Pa.) Raceway respectively. With guidance from crew chief Doug Richert, TWR had a promising debut at Iowa Speedway in July cut short with a late-race accident that relegated the family-owned team to a 30thplace finish. Still, the team is optimistic that their solid performance at Iowa will carry over to Las Vegas’s fast 1.5-mile oval. For his second career Xfinity race, the team welcomesYurpal.com who ups their commitment from the ARCA Series to NASCAR’s top-three stage. Yurpal.com is the first and only online marketing place for the construction and building materials industry. With Yurpal, you can quickly find the building materials and products you need, find local vendors, find local professionals, manage your customers, manage your sales volume, manage your deliveries and more from one easy-to-use platform. With the release of their new features, Yurpal has created an all-inclusive digital community for the construction industry. And best of all, it’s FREE! Yurpal.com CEO Jon De Langis is enthusiastic about his company’s foray with Tullman and TWR. “What a perfect opportunity to promote our new platform and expand our relationship with Max with a Xfinity Series race at Las Vegas,” De Langis said. “We’ve seen great results with our relaunch and we believe that we can continue that upward spike with our debut in the Xfinity Series on Saturday. The Chester Springs, Pa. native heads to Sin City hoping to earn a top-20 finish and use his on-track experience at Las Vegas to propel him to his next race at Kansas Speedway next month. “I’ve been preparing for Las Vegas since the Monday after Iowa,” Tullman added. “I have a very strong group of people supporting me that are putting together the resources we need to make the most of my Las Vegas debut. 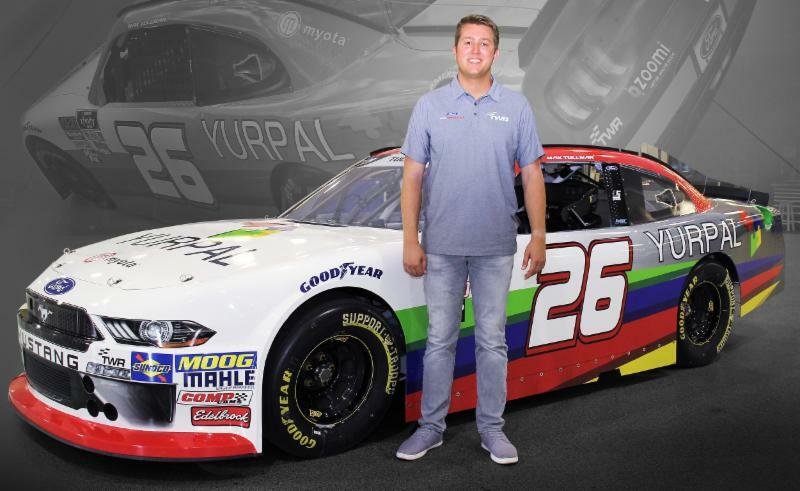 While still working through the different characteristics of an Xfinity car compared to an ARCA car or a NASCAR Truck – Tullman believes he is adapting well – but also knows that every race is a learning experience. “I’m learning with every lap on track,” sounded Tullman. “Las Vegas isn’t going to be an easy track. It’s fast and handling will be crucial to success. Doug, the team and I just need to work on our car through the first two practice sessions and make sure we have a setup that will put us into a good spot for qualifying. Earlier this season, Max Tullman also made his NASCAR Camping World Truck Series (NCWTS) debut for Young’s Motorsports at Chicagoland Speedway. He recently competed for the team at Canadian Tire Motorsport Park and will close out his 2018 tenure with Young’s Motorsports at Talladega (Ala.) Superspeedway on Oct. 13. The DC Solar 200 (250 laps | 218.75 miles) is the 26th of 33 NASCAR Xfinity Series races on the 2018 schedule. Practice begins on Fri., Sept. 14 from 12:05 p.m. – 12:55 p.m. A final practice session is set for 2:05 p.m. – 2:55 p.m. Qualifying is set for race day, Sat., Sept. 15 beginning at 11:10 a.m. The 40-car field will take the green flag shortly after 2:00 p.m. with live coverage on NBCSN, the Performance Racing Network (Radio) and SiriusXM NASCAR Radio (Satellite Radio, Channel 90). All times are local (Pacific).